Let me tell you a story about the galactic core, the people who live there, and the terrible thing that was done to their children. Let me tell you about drummers and dancers, activists and scientists, who suffer together but cannot agree about the manner of their healing. Can they resolve their differences? Can they mend what was broken? Find out in Grandmother Mælkevejen's Belly. I am not a hard-core science fiction fan. I do not like half of the story to be the art of physics. For this reason, I did enjoy this intricate short story. And it is intricate and full of depth and multiple themes. The opening description of the dancers did intimidate me a bit initially, so I decided to put it aside until I could give it my undivided attention. I am actually glad I did. This story feels like a spider weaving a web of stardust all through your head. You may not completely understand how the spider does it, but the result is a beautiful piece of work easily appreciated. The underlying theme of determination makes this a worthwhile listen. They lost a group of folks precious to them and now they dance and trance, attempting to communicate with them, hoping there is still someone left to communicate with. At the galactic core there is the grandmother of all black holes. Some folks drifted too close to the edge. Now the people left argue back and forth about whether they are dead or not, whether they can be rescued or not. This is a rich and dense novelette, full of characters that obviously have back stories. The reader is tossed into the middle of a years-old debate, showing the hopeful and usually drug addled dreamers who believe their long-lost friends & relatives life on and the more scientifically-minded bureaucrats who way the odds and find them wanting. Over time, a percentage of the population has begun to suffer from various diseases – some are born with functional eyes but lack the connection to brain, and other afflictions. Humanity is dwindling with each generation. So they dance & trance, argue & survey, and stay in the area. This is such a dense story, I highly recommend that you give it your focus in order to get the most out of it. Since you are tossed right in to the middle of things, you need to pay attention to work out what is going on. That said, it is highly worth your time. The characters and story line are well written. I love that there is so much that went on before we enter the story, as it gives this tale a full-rounded feeling. The character have agendas and hopes. They have history with one another, and with generations past. Dive into this tale and enjoy! The Narration: C. S. MacCath narrated her own book and I am usually wary of books narrated by the author. However, with this audiobook, set aside all such concerns. She has a range of voices for both female and male characters and does a good job of imbuing the text with emotions when needed. It was a well made audio. Not really. I do not feel I have the grounds to recommend this to anyonye as I did not get the fully understanding of the story here. The narrator seemed to be in a hurry to read through, and I managed fairly easy to just fall in to my own thoughts rather than pay attention to the book. If read just a wee bit slower, not much but enough for the narrator to actually take a breath every now and then. What did you like best about Grandmother Mælkevejen's Belly? What did you like least? Onec the dialogue got going, the story became bareable. I would have skipped the seeming dense exposition at the beginning. There is a good story in here, but unless you really enjoy hard sci-fi, it can be difficult to get into. I think the narration didn't help the story. In this case, the narrator (the author as well) read the story in a very monotone voice. This may have been on purpose, however, because of the nature of the story. But, in my opinion, it made the story more difficult to get into.Every character sounded simliar. Perhaps. Again, there is a good story in here once it gets going, the delivery (narration), and super dense exposition at the beginning made it difficult for me. I actually restarted the audio book three times to try to absorb more of the story. Once the dialogue kicks in, the story starts to feel like a story. Before that, it very much reads like a text book for a class I wanted to sluff. The narration makes it even more difficult to listen to, but again, there is a good story in there once it gets going, and there is something to break up the exposition. This is a short story.It is something about ,well who knows what? !Between the superfast narration by the author and the material,I really could not comprehend what was going on. What would have made Grandmother Mælkevejen's Belly better? Grandmother MAlkevejrn's Belly is a quick short story of a group of people in conflict who resolve their issues in grandmother's belly. The writing is really pretty and descriptive but there is so much information and unfamiliar terminology that it is a hard to follow story. What was most disappointing about C.S. MacCath’s story? Ms MacCath has a really nice smooth voice but she spoke too fast and the recording was tinny. The story itself seemed fine. Very detailed and rather hard to follow as an audio book especially considering how fast the author/narrator was talking. I had to go back and relisten to it, and it didn't really help me at all. I would have probably enjoyed this much more if I were reading it as opposed to listening to it. 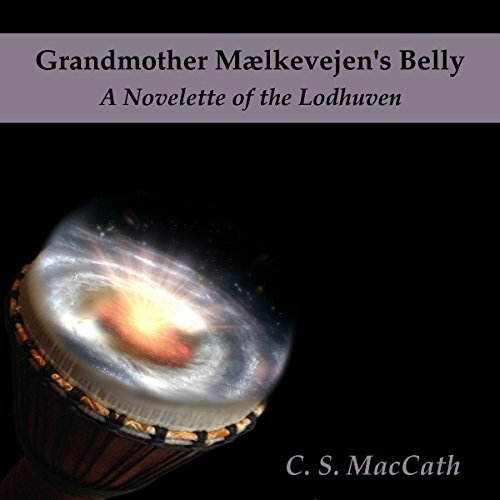 What other book might you compare Grandmother Mælkevejen's Belly to and why? I can't really think of anything that I have listened to or read in recent memory that I could compare it to. There was nothing that I liked about the performance really! I thought the author/narrator read way too fast and did not enunciate clearly which made it difficult for me to follow what was happening in the story. I actually had to listen to it a second time to pick up more details. Next time the author should hire a professional narrator. Was Grandmother Mælkevejen's Belly worth the listening time? It really wasn't! Not for me! I might listen to other books by this author but not if she is narrating them. I received a copy of this audio book from the author in exchange for a fair review.